It's ok though! The hoses can wait! 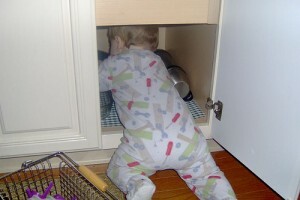 I am happy to hear the silly babble behind me in the car and watch the little guy put toys in and out of the cupboards! He has an easy smile that takes over his entire face and a laid back attitude as long as he can be on the go! What can't wait is baby proofing this house! I had totally forgotten how much those little hands can get into and how even if those legs are little, they are fast! We still don't know how long he will be here, but given the fact that they are moving his crib and high chair here I expect I should at least plan on getting him a Halloween costume! Now the next big question is where to put that crib since all three of the kids are arguing over having him in their room!